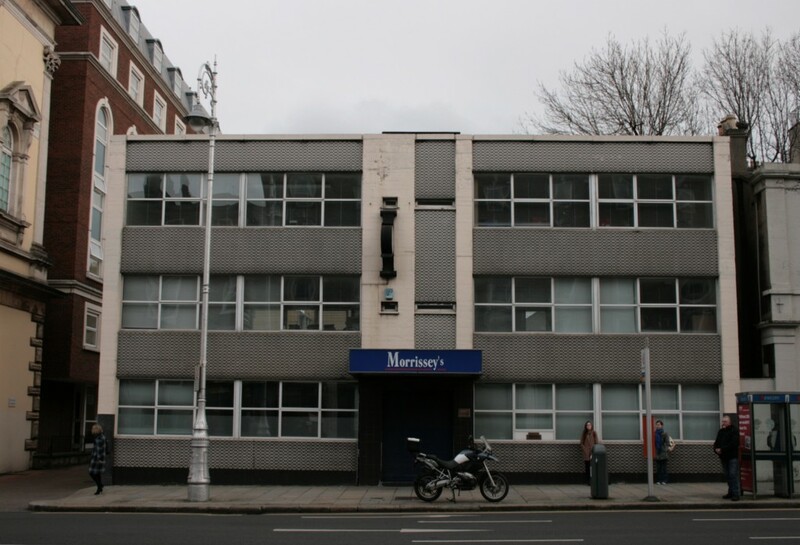 In the context of Merrion Square and its neighbour, the Davenport Hotel, the facade of the Merrion Building might seem a little plain and muted. 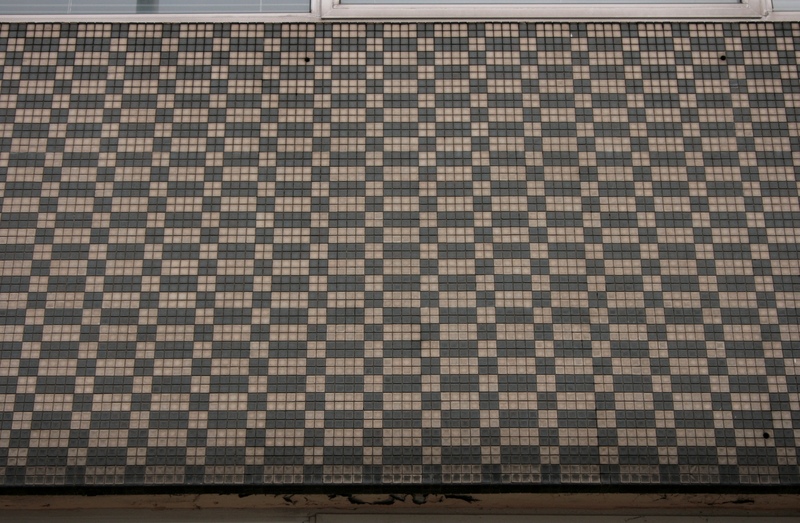 The two ends of the building are in plain blockwork, while the front and rear facade are tiled horizontally between bands of windows and vertical block elements – flat and banded and gridded. 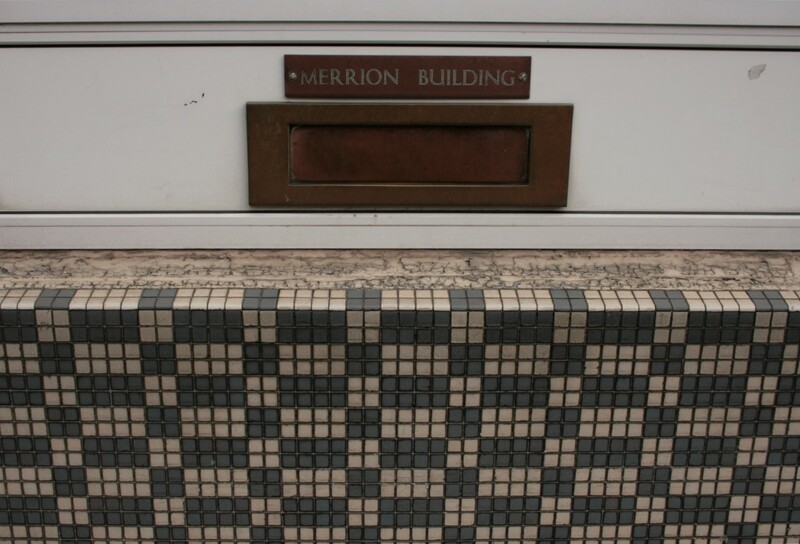 The Merrion Building is home to Morrissey Auctioneers, a family business that began in Tipperary in the 1930s (founded by Daniel Morrissey, Minister for Industry & Commerce 1948-51 in the First Inter-Party Government), moved to Dublin in the 1940s, and moved into Lower Merrion Street around 1956. 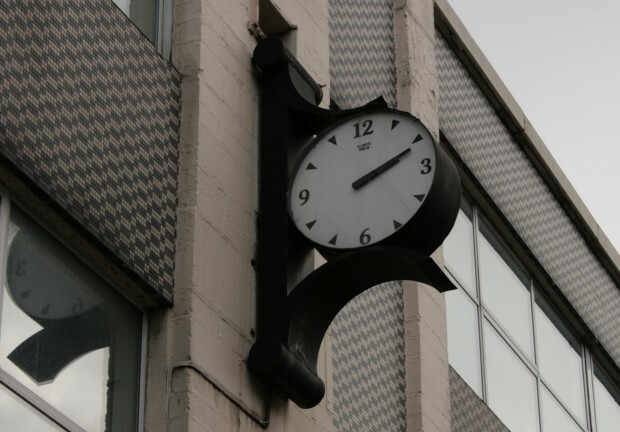 I haven’t been successful in determining the building’s date of construction or its architect, but it appears that this was built for Morrissey’s at that time, 1956-7. 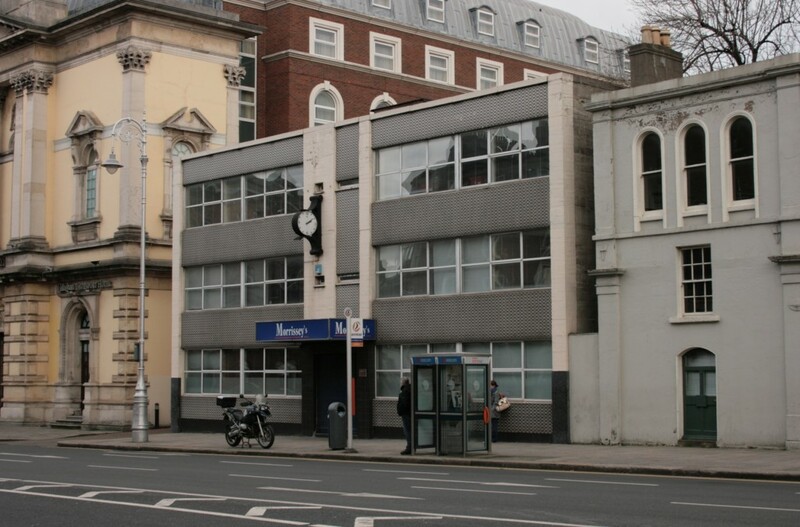 Update: Thanks to the Irish Architectural Archive via Twitter: the architect was Patrick Henry Corcoran. Morrissey’s clearly identified with the image of their building, and this amazing illustration from a property advertisement (The Irish Times, May 9 1956, p.10) confirms this was the location and building in question. The tiles (currently a grey-green and an off-white) follow a 4×4 grid with a double block for every second horizontal count. 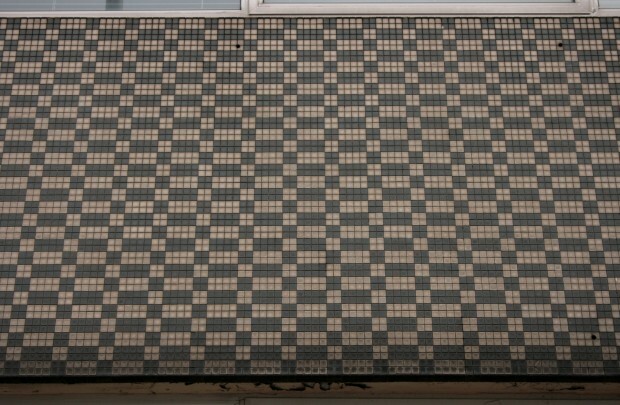 For me, it’s visually interesting in the same way as weaving, like one line of tiles is pulling through to invert the colours along its course. The tiles are ordinary and the pattern is simple, but as it sits between the blockwork, it’s compelling in the same way as running your fingers along railings – the jagged diagonal movement feels like a little friction acknowledging you’re passing by. From the newspaper ad, it looks like a canopy has been there all along – not terribly exciting in terms of either the building’s form or signage, though the minor asymmetry of the centre bay above is nice – but it’s hard to pick out whether the clock was, too. The minimal detail on the face reinforces the sense of the building being plain even when it’s anything but. The clockmaker appears to be Allbrite of Dublin. 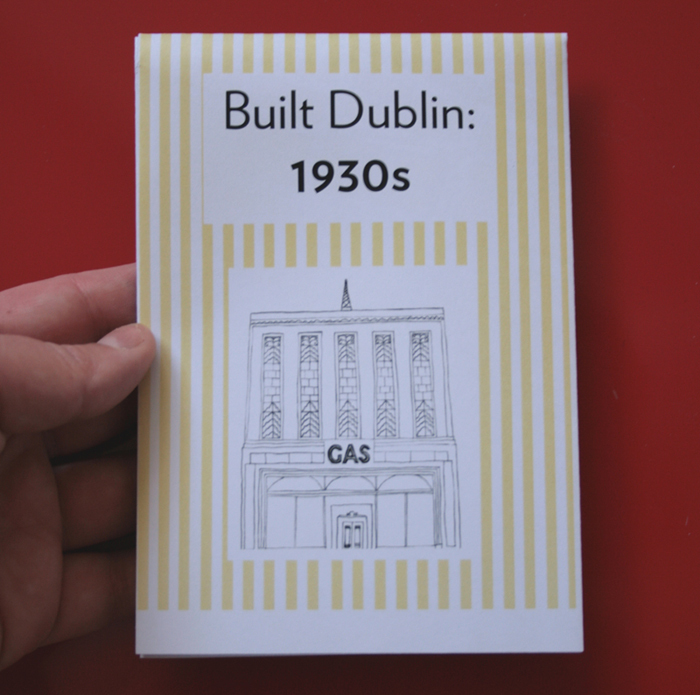 Update: Again thanks to the Irish Architectural Archive via Twitter, the clock does not appear in a 1958 photo of the building in Architectural Survey and is not original.